NED69ers are spread all over the globe. A majority of them are in Toronto, Canada. On July 01, 2018 the Torontonians 69ers and their families gathered at Engr. Naheed Ghazanfar’s place for Eid Milan Dinner. Engr. Rehan Akhtar and Engr. 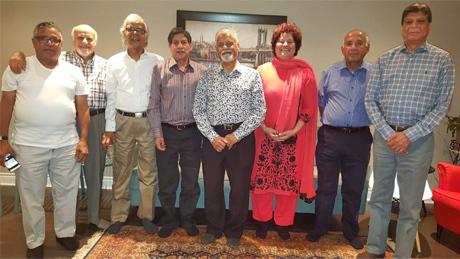 Mansoor Imam could not join as both were busy with their guests visiting them from Pakistan. There were two newly married couples, Engr. Syed Sibte Kazim’s daughter Hibba with her husband a very beautiful fine and lively couple and Engr. Aftab Ahmad’s son with his wife who got married last year in Karachi. Engr. 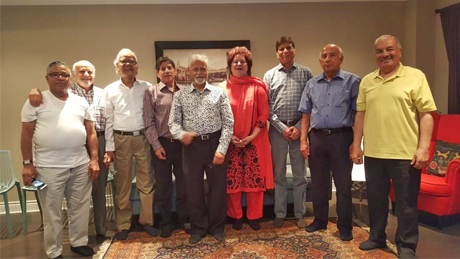 Romer Keumer’s and Mrs. Ferny who is very literary person, all the other spouses Mrs. Samina Mahmood Manzoor, Mrs. Qamar Mansoor Kureshy, Mrs. Talat Aftab Ahmad, Mrs. Ferny Keumers and Mrs. Fauzia Sibte Kazim were present. The dinner was nicely arranged by Engr. 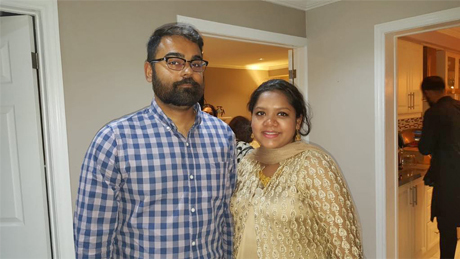 Naheed’s sons; Najam-Carishma and Ahsan-Paula. 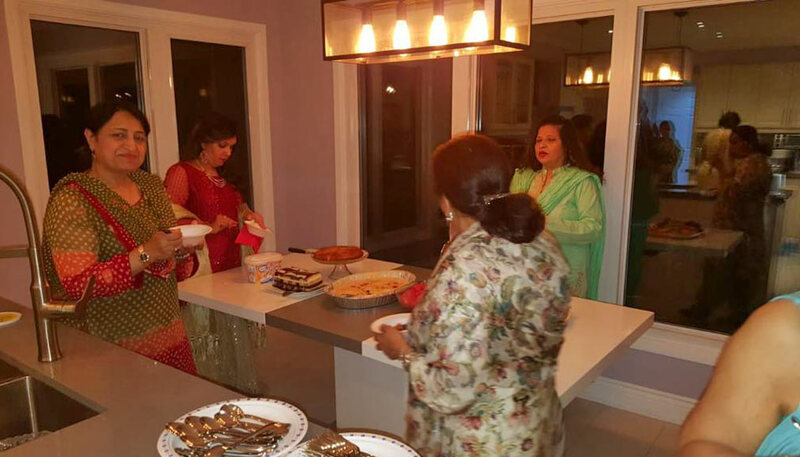 The food was traditional Pakistani with appetizers, biters, with dips and fresh vegetables followed by usual dinner Korma, Pullao, Tandoori Chicken, Channas, Naans (a special item in Canada as Naheed’s son got fresh ones from a tandoor) Followed by Desserts; fresh fruit, some cakes and a special dish Labe Shrin. 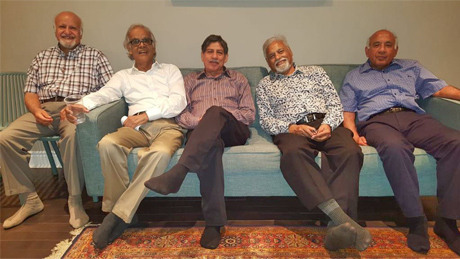 We had long chats covering all the 45+ years’ Professional journey. We all feel so proud that we have known each other before we picked up our spouses and share such lovely memories from our youth. We still remember in our memory lane Prof. Zia Ul Islam, Prof AT Khan, Prof. Mumtaz H. Qureshi, Prof. Dr. Mohammad Ibrahim, Prof. Rustam Mirza, Prof. Khatri Sahib, Prof. Haider Sahib, Prof. Azizul Hassan Sahib, Prof. FG Khan Sahib, Prof Soomji, Prof. Salahuddin Sahib and Kazmi Sahib. We cannot forget our seniors Engr. Zafar Ahmed (Chapta), Engr. Fazal Ahamd (Kalya), Engr. Nooruddin Ahmad, Engr. Asfia Aleem (First Lady Engineer of Pakistan) and Engr. Kausar Salam. Last but not the least we all want to pray for fast recovery of Engr. Naheed Ghazanfar as she was hospitalized with pneumonia and as per the last news she is recovering and much better now.